Some people just can't sit still - and with the Everyday Kore Stool, you never have to. An adjustable height lets you keep things moving no matter where you are working. 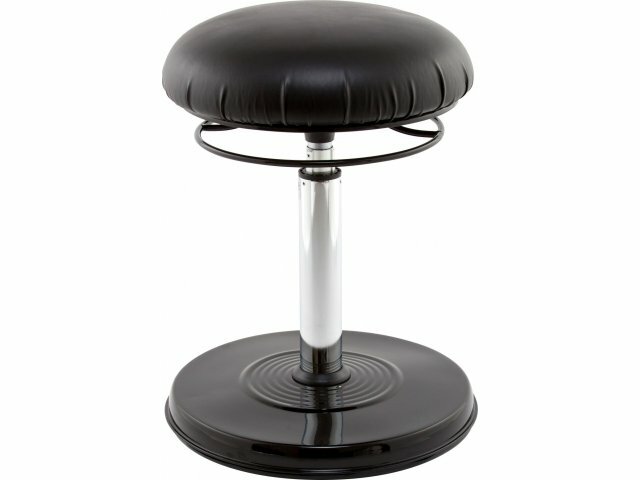 There’s no doubt about it, Kore Stools really rock. An ingenious patented design lets you stay active while sitting at your desk, typing and going to meetings. Kore stools have an innovative, gently-rounded ergonomic base that lets you move and flex without making any adjustments or leaving your seat. The gentle rocking motion relieves soreness and stiffness by promoting constant movement and correct posture, exercising legs, back and abdominal muscles. 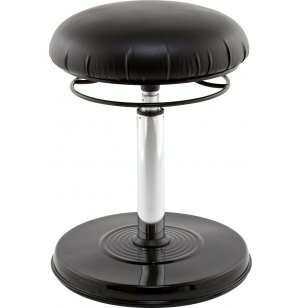 This unique piece of ergonomic office furniture will transform the experience of your employees. With less pain and more movement, come greater productivity, increased focus and higher workplace satisfaction. Don’t underestimate the power of a Kore Stool. With so many physical and professional benefits, it’s no wonder Kore Stools have been featured in prominent locations including the Museum of Modern Art Design Store and the New York Times Personal Shopper Column. Healthy Motion: Gently-rounded ergonomic base promotes constant movement and correct posture, relieving pain and stiffness. Active Sitting: When you can move around at your desk, it is easier to concentrate on the task at hand. Sleek Cushioning: Black padded upholstered seat coordinates with many styles of office furnishing. Adjustable Height: Supported by lever-operated, non-rotating, pneumatic, adjustable-height cylinder post with chrome finish. Durable Materials: Stands on black powder-coated stamped steel base with vinyl cover. Floor Protection: Rubber bottom prevents scratches and scuff marks. The price for this item includes shipping and handling in the continental USA. Leaves the factory in approximately 5-7 business days.